In his childhood, he often reached school late even though it was 10 minutes’ walk from his house. The reason: he couldn’t help stopping at a pan shop on the way to listen to film songs. Today, Bishambar Dass Sharma (53) is a die-hard Mohammed Rafi fan and a core member of the Rafi Yaadgaar Society, the only organisation of its kind in the country to encourage fresh talent and spread awareness about the not-so-familiar songs sung by the legendary singer. Every year, the society holds a singing competition and declares the winners on Rafi Nite in November, to mark the birth anniversary of the celebrated vocalist. The society, which came up in Chandigarh with the initiative of a few Rafi admirers like B.M. Kalia, Arvind Verma, Aftab Rai Mani and Sharma in 1985, was formally registered in 1986 as Amar Gayak Mohd Rafi Memorial Society, and got its present name in 1989. Since 1989, when Rafi’s son Shahid was invited to grace the Rafi Nite, Sharma has been going to Mumbai every year to ensure the presence of renowned artists at the function. Lyricists Hasrat Jaipuri and Majrooh Sultanpuri, actors Rajinder Kumar and Biswajeet and music directors Ravi, O.P. 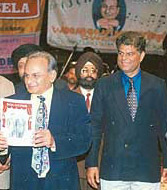 Nayar, Anandji, Pyarelal and Naushad have been some of the leading lights who have visited Chandigarh to present the Rafi awards. Looking back, Sharma recounts that though at times artists have been more than willing to oblige the Society, there have also been occasions when it has taken years to just seek an appointment. It was only after 11 years of persistent requests that Naushad agreed to come in 2000. While this year Sunil Dutt has gladly accepted the invite. Rafi’s widow Bilqis, who attended the function in 1993 and gave away the first Rafi award, was overwhelmed by the Society’s work and the response to the singing contests, which has participants coming from as far as J&K and Delhi. She remarked: "I’ve been to a recording only once with Rafiji. I’m overcome seeing so many singers here. Perhaps, this is the only sansthan which is doing so much to keep the memory of Rafiji alive." Interestingly, the Society has till date included more than 1000 songs of the Mohammed Rafi in the competitions held. Every year, junior participants are asked to learn 10 songs and the senior artists are required to rehearse 20 numbers. The effort here is to include the not-so-known songs of the artist. Sharma, who has a collection of 4,000 Rafi songs, regularly makes a trip to Meena Bazaar in Delhi to record old unknown songs of his idol. And, he would like to continue his hunt till he tracks down all 6,000 songs recorded by the gifted singer, many of which are unavailable in the market. Dubbed the "Encyclopedia of film songs" by Pyarelal, OP Nayar and Anandji, Sharma finds it hard to pick out his favourite Rafi song. "They are all masterpieces," he says, before setting for Hai kali kali ke lab par, tere husan ka phasana from Lala Rookh and Yeh Duniya agar mil bhi jaye to kya hai from Pyasa. An employee of The Tribune, Sharma’s spare hours are spent on his passion — keeping Rafi alive.